As the day of thanks quickly approaches, many people are midway through their holiday shopping. Thanksgiving used to be a time of togetherness and giving thanks for the things you currently have, not a mad dash to step over people to save five dollars on a hot new toy. Americans often experience higher levels of anxiety during the holiday season, with many people worrying about having enough time, energy, and finances to cover everything. Before you get lost in the holiday spirit, our local brewery bar is here to offer a safe haven for relaxation and flavor! 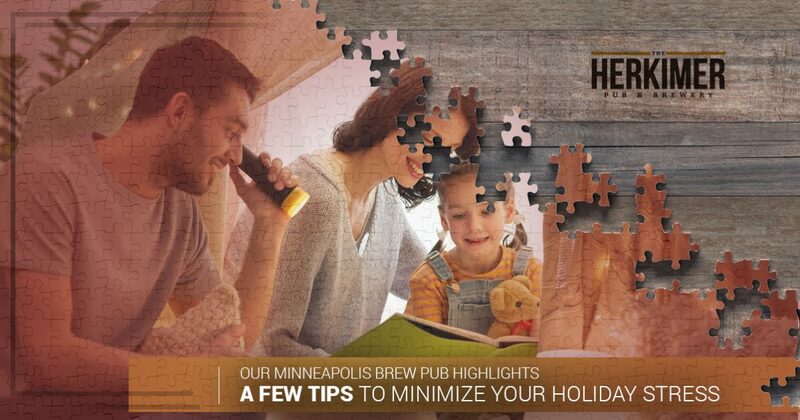 The Herkimer is proud to be your trusted brew pub in Minneapolis, crafting pure brews to match our delicious fares. Since 1999, our team has worked diligently to perfect our practice, relying on positive feedback and tasteful inspiration to get the job done. We love the holidays and their traditions, but understand that navigating this time of year can prove stressful. Today, we’ll highlight a few quick tips that may help you keep calm this season. If you’re over shopping and ready to treat yourself with the best beer and food in the city, be sure to stop by The Herkimer! Santa may have a shop outrigged for success with a team of specialized employees, but you are likely left with whatever you can craft or secure with your bank account. We recommend taking a step back and looking at your gift budget — a set budget, not one that will fluctuate based on individual demands. Be sure to add up all of the loved ones you plan on buying for this holiday season and begin configuring how you will make everything fit. The more time people spend on this list, the better they tend to do! Remember that certain relatives will expect less from a gift than others, so go through your list, and be sure to check it twice! Many families are happy to get to the holiday season, but members soon after fall into their own routines. Before time runs out and you’re in the new year, we recommend putting some fun events on the calendar. Every family is different, so be sure to focus on activities that are fun for everyone involved. By scheduling these events on the calendar, you are helping to ensure that your quality time does not get pushed back or double-booked. See a movie, go on a trip; as long as you are spending time with loved ones, all should be well! In the hustle and bustle of the holiday season, many people lose sight of why they are doing it all — the family. Regardless of your reasoning, missing family time can largely impact the experience and memories developed by your little ones. Children have a select number of opportunities to make the most of the holidays and create lifelong memories, but can only do so in the warmth and comfort of the family dynamic. If you have been working long hours to finance your holidays, be sure to set aside some time for your family. Doing so may increase the short-term stress, but ultimately it should prove to be priceless! Grab a Beer With Us! Sometimes, the best way to unwind during the hustle and bustle of the holidays is to visit your favorite local brew pub in Minneapolis for a change of pace. The Herkimer is here to deliver quality food and drink in an enjoyable atmosphere, allowing holiday-goers of all types to sit and take a moment for themselves. The holidays can be a time of stress for many people, making it essential to take some time to focus on yourself. If you can’t find a calm center to get through this time, how can you expect to bring joy and cheer to others? When the stockings are hung and the gifts are wrapped and securely hidden, be sure to take some time to unwind at The Herkimer! We’re here and always ready to provide a relaxing atmosphere. Contact us today with any questions, or stop by our craft beer pub on Lyndale Avenue South to try one of our beers for yourself!